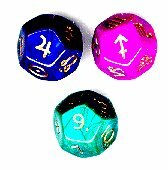 This is a set of three 12-sided dice, one green, one blue & one violet (looks pink on the screen), one with planets (including north & south nodes), one with the 12 signs & one with the 12 houses. Think of a question, roll the dice & read the answer. Will you get that raise? Jupiter in Taurus in the 2nd, it’s a sure bet! What kind of day are you having? Uranus in Scorpio in the third: A strange, surprising one. Use these dice to sharpen your skills in all areas of astrology: Relationships (what’s he up to now? ), Horary (where’s my watch? ), Forecasting (what will happen when Venus conjuncts my Sun? ), Electional (should I get a new job?) & more. Includes a 24 page booklet of instructions (English & Spanish) & a black drawstring bag. Lots of fun, a great gift for the novice. Wessex Astrologer. First published, as The art of Chart Synthesis in 1979, revised, retitled (The Art of Chart Interpretation) and published by CRCS in 1986, this 2009 Ibis Press is the third edition of this book. For this third edition, Marks writes, ... I have only made a few alterations to the first two sections of this book, and have added an appendix of planetary keywords (appendix 1). Additionally, she has expanded the third section, on Astrological Counseling. Muhammed Ali is a Sun - Aquarius - Capricorn - Taurus - 6th house - Moon square Uranus type. He has ten fixed signs, no water signs, six retrograde planets, a T-square to Mars in Taurus in the 9th, a grand earth trine, Moon in Aquarius square Uranus, Sun in Capricorn in the 6th as part of a locomotive pattern, Saturn near the MC, Venus descending in mutual reception to Uranus. Everything you need to know about Mr. Ali, who was born on January 18, 1942, 6:30 pm CST, Louisville, KY. You then apply your interpretive skills to this analysis. Ibis Press (RedWheel/Weiser), 188 pages. Contents: List of figures; Acknowledgements; 1. Introduction & history of astrology; 2. The planets; 3. The signs; 4. Essential dignities; 5. Interpreting planets in signs; 6. The angles, the houses & the Part of Fortune; 7. Basic interpretation; 8. The aspects; 9. A brief look at natal retrograde planets; 10. Eclipses, lunations & the moon's nodes; 11. Aspect patterns; 12. Synthesized chart interpretation. Appendices: A. Natal chart interpretation worksheet; B. Astrology organizations, resources & web pages; C. Astrology software; Bibliography; Index; List of figures. Comment: This is intended as a beginner’s first astrology book & it’s a good one, but it also bears the fruits of the ‘back to basics’ movement of the 1990’s & more besides. So in addition to planets, signs, houses & aspects, are sect, dignities, rulerships, face, peregrine, dispositor trees, retrogrades, eclipses, lunations, aspect patterns (including harmonics), synthesized chart interpretation & much more. Excellently written, will be a classic. Part 3: The planets: 6. Sun and moon - archetypes of light; 7. Mercury - the wings of thought; 8. Venus and Mars - love's tug of war; 9. Jupiter and Saturn - voices of the father; 10. Uranus, Neptune, and Pluto - avatars of change. The stars offer a gift, the gift of self-discovery. The mythical past of astrology has pertinent psychological significance for the modern consciousness. In The Astrology Sourcebook, Shirley Soffer builds a bridge of understanding between ancient thinking & modern Jungian archetypes, leading to a deeper comprehension of our consious & unconsious selves. Contents: Introduction; The astronomy of astrology; The seasons & qualities & elements; The houses, Houses & qualities & elements, the planets in brief; The journey: the signs, Anatomical rulerships, a pause to reflect, Intercepted signs, first studies of chart synthesis; The planets, retrograde planets, putting it together, planetary emphasis; The aspects, planetary powers, decanates; The journey continues. .
[This book] not only explains the basic principles of traditional astrology with unusual clarity, but it also gives the reader the guidance & procedures needed to put the pieces of a birth chart together for self-understanding - rather than relying on simplistic "cookbook" interpretations. It has a sound, down-to-earth quality that makes it easy & valuable for both beginners & advanced students. ...it is ideal for those in search of the depth of the chart....Loaded with unique features, it includes the interplay of planets, signs, cusps and houses as they influence the entire chart, weaving together major life themes.